Now I know where all those See Rock City birdhouses come from! We visited Rock City for the first time. This is an attraction taking advantage of nature's rock formations and adding landscaping, stone bridge and walking paths. This is a self guided walking tour of some of the most beautiful landscapes in the country. You enter The Enchanted Trail passing beautiful gardens with an array of seasonal flowers and trees. The stone artworks (massive formations) includes a garden of piled up pebbles, a rock shaped like a mushroom, and statues along the way. The music as you go along the trail is very relaxing too. If you like lookout points, valleys, and waterfalls, you should probably see Rock City. This is the start of our long and fun adventure to Rock City. Once you pass through the turnstiles there's no turning back. The Trail is so narrow, and the volume of pedestrian traffic is so persistent, that you're propelled forward whether you want to be or not. 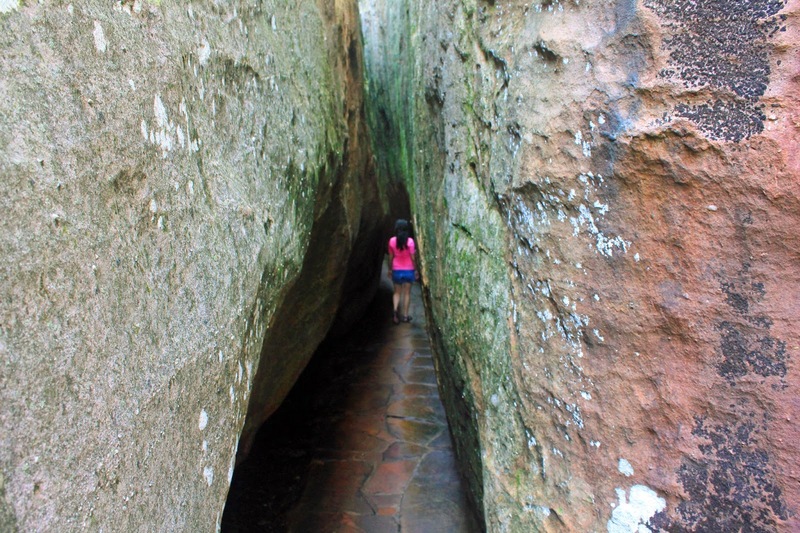 The trail carries you onward, through Goblin's Underpass, under 1000-Ton Balanced Rock, and into the Hall of the Mountain King. Then passing needle's eye path, you have to slide yourself sideways to get to the other side. Challenging but we had a great time. Then to the Swing-a-Long-Bridge it hangs suspended over a deep gorge, and it's fun to bounce up and down as the nervous people behind you look for a way out. The views from the bridge are breathtaking! Finally, footsore and perhaps a little winded, you find yourself at the entrance to Fairyland Caverns. Fairyland Caverns is Frieda's masterpiece, where Rock City abandons the real world and ventures into its own wobbly realm of fantasy. Our last stop to complete this wonderful journey is the Lookout Mountain Georgia. What a magnificent place!! I would love to go there--well maybe not so much walk over that bridge--unfortunately I do not live anywhere near Tennessee. Beautiful pictures you caught! LOVE LOVE LOVE!! What great photos and the scenery is beautiful! I would probably suffocate when crossing that skinny pathway but its beautiful! Beautiful!!! Great pictures! We've got friends in Tennessee that we need to visit and I need to see about adding a detour to visit Rock City! My kids (and I, of course!) would love it! Looks like a great place to go outdoors. Ahhh.... for sure I'll not cross that hanging bridge for sure..lol That needle like passage is cool! nature is fantastic indeed! would love to go and visit there! it looks amazing on top of it the whole view is just breathtaking! Wonderful place to unwind. The "Needle's Eye" path looks challenging to pass through especially if you are big. Oh man, I do not think I can do this ..walking in that tiny pathway. I am claustrophobic. Seems a good place to visit. Crossing that hanging bridge must be very exciting. Nature is an amazing gift for humans to appreciate and this ROCK CITY GARDENS bring people close to GOD. What a very nice place! Stones can be a great ornament for natural beauty. Those are big rocks! Lol I missed going on eco-trips with my friends.. It's been a long time since we last had one. This post just serves as a reminder that I need to do it soon!